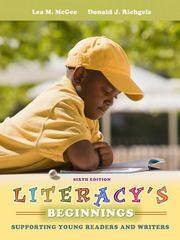 Literacy's Beginnings 6 Edition Literacy’s Beginnings: Supporting Young Readers and Writers, 6/e is one of the most talked about resources for prospective and current teachers of children from birth to age eight. It offers an integrated approach to reading and writing instruction keyed to the five typical stages through which most children pass: the IRA/NAEYC phases of literacy. Included are clear, simple explanations of the issues addressed in Reading First and Early Reading First legislation which all teachers of children must know; excellent coverage of assessment, including ready-to-use assessments in the appendices; Tie-In features that send readers to exemplary websites and suggest methods of integrating technology with reading and writing instruction; and new, expanded sections on differentiating instruction for struggling readers and writers, for children who are English Language Learners, and for children who have been identified as needing more intensive instruction as part of the Response to Intervention process.